At The Penny Hoarder, we’re no strangers to the hard work of price comparison. We’ve done the footwork to figure out the most valuable warehouse club membership, and the legwork — pun intended — to figure out the best cheap leggings. It’s not always easy, and it can be time-consuming, but finding the very best deal is always worth it. So when we were faced by this most important question, we knew we were up to the challenge, as tough as the job might be. Is Expensive Chocolate Actually Worth It? To answer this ambitious question, I spent an entire morning feeding chocolate to my blindfolded colleagues and asking them what they thought. For science. We chose five kinds of milk chocolate at varying levels of fanciness and expense, all of which are available nationwide at grocery stores. Full disclosure: I’m really more of a dark chocolate person, myself. And obviously, you could easily find more expensive, fancier chocolate under glass at your local gourmet chocolatier — or spend a bundle on a premium, single-origin dark chocolate bar. Even though it’s pretty cheap, we simply had to include this timeless classic. It’s so well-cherished and nostalgia-inspiring that many of our tasters were able to correctly identify it, blindfolded and all! While our medium-sized bar cost 54 cents per ounce, you can find this stuff even cheaper. At the CVS around the corner from the office — which isn’t exactly the best bargain shop in town — we found a 7-ounce Hershey’s bar that broke down to just 46 cents per ounce. 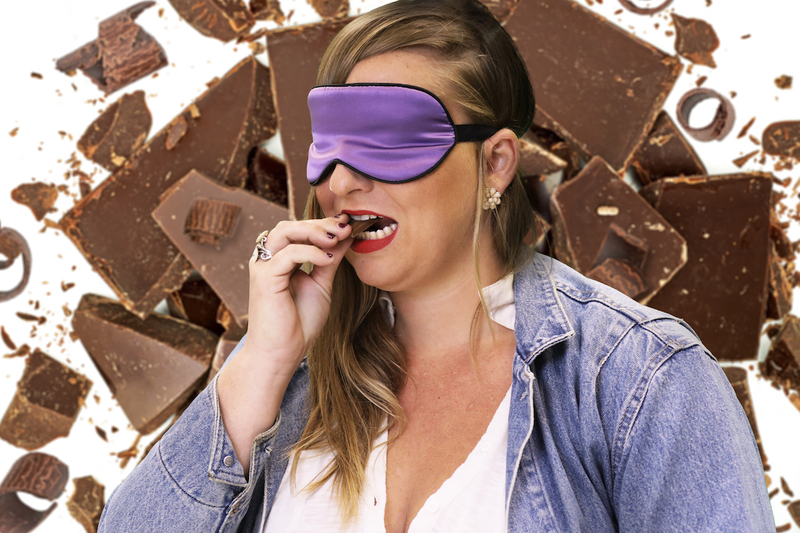 But although our tasters recognized Hershey’s, no one voted it their favorite after completing the full tasting. In fact, when tasting it next to other, higher-quality chocolates, tasters called it “basic” and “too sweet.” A few said the texture was chalky after trying the smooth, pricier bars, and one mentioned that Hershey’s melted on her fingers more quickly than other bars. Verdict: This affordable classic is a go-to (especially on Easter and Halloween), but it might be worth upgrading now and then. The British answer to an American classic like Hershey’s, plain old Cadbury dairy milk chocolate is pretty darn cheap, too. Although the 3.5-ounce bar I bought for $2.49 at CVS came out to 71 cents per ounce, I later saw the same size at Publix for just $1.89, which would have been the same 54 cents per ounce as our Hershey’s bar. Tasters’ reactions were about on par with the price — similar, if a little bit upgraded. Many commented that the Cadbury was “creamier” than the Hershey’s they’d tasted before, whose texture seemed “chalkier” in comparison. But a couple of staffers mentioned that Cadbury had a tendency to get stuck in their teeth rather than melting in their mouths like others. Quite a few were skeptical: “I’m not sure if I’m a fan,” mentioned editorial intern Jacquelyn Pica. I’ll go ahead and lay my cards on the table, though: Cadbury was my favorite of the bunch, although I didn’t do my tasting blindly. I was, however, alone in my devotion. Verdict: A slightly different experience than Hershey’s, but similar on a quality level (and in price). If you’re going for a cheapie, either will work — it just depends if your tastes run more U.S. or U.K.
Yup, you can get a bar of the same Dove chocolate you buy by the bag (individually wrapped with foils whose “promises” are more sickly sweet than any milk chocolate could ever hope to be). And this pricier bar was the first of the chocolates that showed a level of complexity, according to staffers. Staff writer Dana Sitar immediately concluded the bar “[felt] fancier” in shape alone, before even tasting it. The bar breaks into Dove’s familiar little domes, adding some intrigue flat rectangles might lack. Verdict: Still affordable, this one’s a great option if you want a flavorful sweet that’s a little less straightforward and familiar. Two of our nine tasters named Dove their favorite. This chocolate marked our first venture into a more “serious” realm, what with Lindt’s Swiss lineage and elegant wrapper. But perhaps in part due to having started the tasting with sweeter options — or perhaps due to a love of good, old, sweet American chocolate, Lindt drew mixed reactions from our crowd. But those who liked this chocolate really liked it, preferring it to all the other options by a wide margin. For them, Lindt was a breath of fresh — or at least not-quite-as-cloyingly-sweet — air. “This one is awesome,” said van der Hoop. “It tastes like a higher quality chocolate.” She also mentioned that it melted well in her mouth. Verdict: If you wanted an upgraded experience and your sweet tooth is a touch tamer than others’, Lindt is an affordable Swiss chocolate option — and it was the favorite of two TPH staffers. But if you just need to satisfy a simple craving for sweets, you can probably get away with spending less. At almost a full dollar per ounce, this was far and away the priciest chocolate we tasted. But as it turns out, you get what you pay for. This bar was the favorite of five out of our nine participants — more than half! But according to their descriptions, the overwhelming preference for Godiva makes sense. This bar seemed to bring all the sweetness and creaminess of straightforward, cheap milk chocolate like Hershey’s to an elevated level with a greater depth of flavor. Everyone loved its texture, describing it as creamy, melty and smooth. Verdict: Although pricy, this bar is worth every penny — although it wasn’t a unanimous favorite, it won by a hefty landslide. If you really want to up the ante, consider shelling out to give it a try. After all, what better reason to hoard pennies than to spend them on fantastic chocolate? Your Turn: What’s your favorite brand of milk chocolate?